I want to start learning more about my Camera-Critters friends. So, each week, I'll ask you a question. If you want to answer, leave it in the comments. If you don't feel like answering, that's O.K. too. :-) We've got a great group of people here. So, I thought it would be fun if we got to know each other more. I, of course, love photography. I also enjoy creative writing, jewelry making, and outdoor activities, such as fishing, walking, and camping. Any special Mother's Day plans or a special "Mother" story? My story is a little different, as my aunt and my grandmother were my "mothers" by the true definition of the word. I will forever be grateful to them for all they did for me and all the taught me. What has the weather been like there? First, I wanted to be a vet. Then, I wanted to be an Archaeologist. Then, I wanted to be a computer programmer. Last, I wanted to be a journalist. Welcome to the Camera-Critters meme. We hope that everyone enjoys this meme which is all about photos of animals/critters. 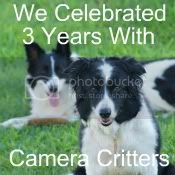 So make your post, link back to here, visit other Camera-Critters captures, and have fun! HUGE THANKS TO ALL OF THE CAMERA-CRITTERS PARTICIPANTS FOR MAKING CC SUCH A SUCCESSFUL MEME. HAPPY THREE YEAR ANNIVERSARY!!!!!!!!! Yes, THREE YEARS!!! If you join in with Camera-Critters this week, feel free to grab the badge in the sidebar! Thank you to everyone for making Camera-Critters so much fun! Coffee, Tea, or Hot Cocoa? Or something else entirely? I drink two cups of coffee each day, and I do LOVE my daddy's hot cocoa! Sorry about last week with the linky. Our linky provider switched servers, and this upgrade caused the link sign-ups to be down for awhile. What's your dream Valentine's Day gift/date? If you were stranded on a desert island, what three things would you want to have with you? That's one you might need to think about for awhile. What's your favorite book or author? I've got too many to mention! I LOVE Prodigal Summer by Barbara Kingsolver. I also enjoy James Patterson's Women's Murder Club Mysteries. I love a good mystery, especially legal mysteries, such as those by John Grisham. I LOVE the show Dharma and Greg and am so glad they started playing re-runs of it. I'm also a fan of House, Fringe, Grey's Anatomy, Private Practice and American Idol. If you could do anything for a living, what would it be? What was your favorite Christmas gift? If you do not celebrate Christmas, what is the favorite gift you've received? Two and a Half Years!! !